Too much water is just as bad as not enough. Keep your garden free of standing water using these strategies. We all know the old saying “April showers bring May flowers,” but what if all those spring and summer rains only bring muddy puddles to your garden? If you notice that even a moderate rain leaves you with areas of standing water, or even just your regular sprinkler system, you have a problem on your hands. There definitely can be too much of a good thing when it comes to water. Standing water can make your plants vulnerable to disease. Root systems can rot, leaves can yellow or turn brown, and moss and algae can become a serious problem. In addition, standing water in your garden can attract mosquitoes and other unwanted pests. There are solutions for fixing this, however, if you know what to do. Did you know you could test your soil’s drainage rate yourself? It is a fairly easy process, and all you need is a large can and a spade. First, remove the top and bottom of an empty and clean 46-ounce aluminum juice can. Then, dig a four-inch hole big enough for the can in the area where you wish to learn the drainage rate. Place the can in the hole, and back fill around it with fresh soil, pressing the soil against the can to hold it securely in place. Now fill the inside to the rim with fresh water. Wait one hour, and then measure the amount of water that has drained through the bottom of the can. If the water drops four inches or more during that hour, your soil drains too quickly, and as a result, your plants may be getting too little moisture. If the water level drops less than an inch, your soil has poor drainage probably becomes waterlogged easily. A soil mixture that drains well should drop about two inches in that hour. 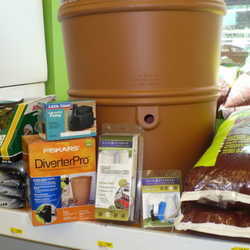 You don't have to start bringing out the bucket or the hose to bail water our of your garden. Start getting rid of standing water by simply changing your soil composition. To find out what kind of dirt you have, take a sample to your local university extension service office. 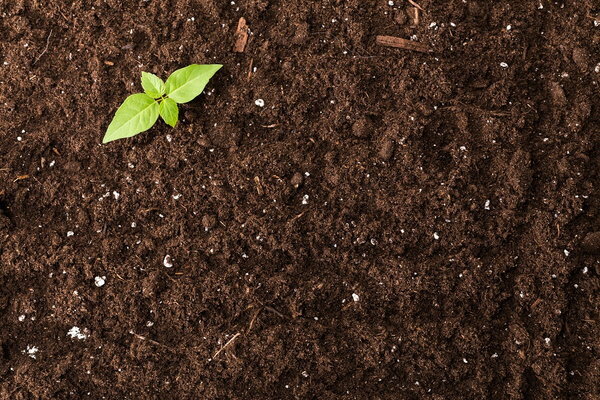 If you have poor drainage, odds are you will have higher clay content in the ground in your garden. You can lessen water retention on your garden by mixing in organic matter. A combination of compost, dead leaves and wood chips, and horticultural sand should be worked into the existing soil with a spade or tiller. Your newly rich soil also will also attract more earthworms, nature’s own aerators, to help the ground drain better. 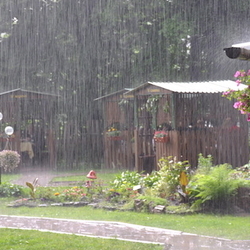 Another option is to add some plants that like wet conditions to your garden. In time, these plants will absorb the excess water and make your soil more permeable. Some varieties to consider are maples, astilbe, willows, ferns, beebalm, filipendula, mint, irises, canna, water hyssop, cattail, and elephant's ear. Water will always flow to the lowest point, so examine your garden for ways to help excess water run to a different location where it can drain without killing your plants. Is the extra water coming from your roof or your driveway? Install drains or gravel pathways to divert the water elsewhere. Make sure your gutter downspouts are running freely so that gutter overflow isn’t pouring into your garden as well. 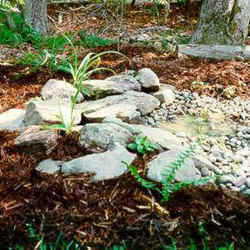 To eliminate standing water, you may need to do some reshaping of your garden. Look for slight depressions that may be where rain is accumulating. If you find any, start by removing all leaves, grass, and plants from the area. Then, fill the depression with topsoil and tamp it down. Grade the newly filled-in hole so that water will flow away from the rest of the garden, and then cover the depression with seeds or seedlings. Their roots will help really set this dirt in place for the long haul so it doesn't wash away. Add a thin layer of topsoil and straw to protect seeds or seedlings until they are established. 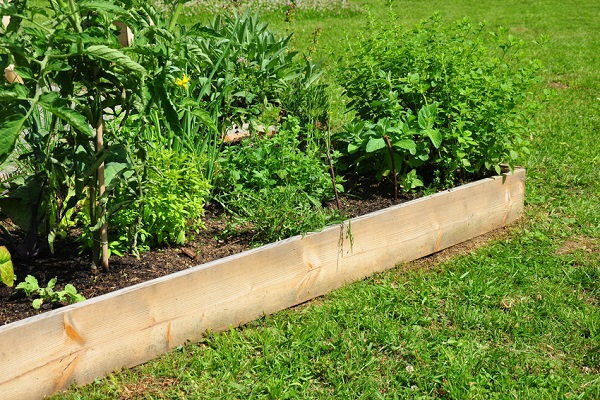 Raised beds also may be a good option for better drainage. Since gravity is always at work, realize that where you see the standing water may not be the source of the problem. Investigate outdoor faucets, hose connections and water features for potential leaks, and then make any repairs needed. This will save your plants from drowning, but also your wallet. If, after trying these basic steps, you still have a problem with standing water in your garden, you may need some expert help. Contact a landscaper about possibly creating a French drain system, a curtain drain, a dry well, or a sump pump to keep excess water from accumulating.